All plants — even “poisonous” plants — contain all the essential amino acids. This means that all plants are "complete proteins." That said, some produce items are particularly low in a specific amino acid or two, which is one of many reasons why it is vital to vary what you eat. For example, blueberries are low in the amino acid lysine, but watermelons, cauliflower and spinach are all high in lysine. Click here for the full scoop on protein. Every plant has a wide array of minerals, vitamins, antioxidants, carbohydrates, fats, fibers and (as just mentioned) proteins. Keeping that in mind, isn't it pretty meaningless when someone says "mushrooms have a wide variety of essential vitamins and minerals"? This sort of statement appears in articles across the web and in magazines, yet they are entirely meaningless. The only substances which don't originate in plants — such as vitamin K2, vitamin D and vitamin B12 — can still be obtained without ever consuming another animal (otherwise, how would wild herbivores survive?). Vitamin D is a hormone created by animals when their skin is exposed to the sun. It isn't really a vitamin, but it is needed for utilizing calcium. Vitamin B12 is produced by bacteria, and is more like a mineral than a vitamin. Vitamin K2 is converted into K2 from K1 within animals such as humans. Vitamin K1 comes from plants. Vitamin K2 is essential for transportation of calcium, and without it you have calcium in your arteries instead of in your bones. While plants don't contain the three items mentioned above, you'd be hard-pressed to find any plant that didn't contain at least some vitamin C, some calcium, some magnesium, etc. Plants (roots, stalks, leaves, flowers, fruits and seeds) tend to contain some of all of the plant-based vitamins and minerals we need. Also, almost all leafy greens contain omega-3 fatty acids. That's right — there are already healthy fats in your greens before you add flax oil to your salad. 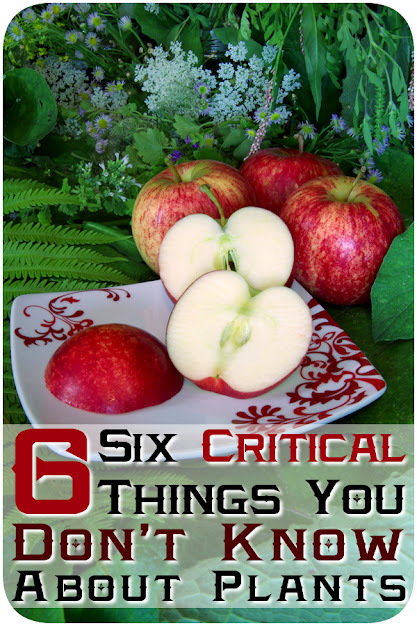 If these subjects interest you, check out The Surprising Truth About Vitamin C, My Comprehensive Antioxidant Chart/List, and How to Solve Nutritional Deficiencies With Food. Fruits are the part of the plant that holds the seeds. Fruits include squash, eggplant, avocado, zucchini, cucumber, peppers, kiwi and tomatoes. Seeds are the part that can grow a whole new plant. Seeds include beans, nuts and grains. Corn is a seed, t'eff is a seed, peas are a seed. Many spices and flavorings come from seeds such as vanilla, chocolate, nutmeg, coriander, and fennel. Vegetables include roots, stalks, bark, leaves, sprouts, and flowers. For example, sweet potatoes, cinnamon, celery, broccoli, kale, and spinach are all vegetables. When it comes to nutritional density per calorie, vegetables are (on average) four times as dense in nutrition as fruits, and fruits are about eight times as dense as seeds. This is flipped when you measure nutrition per volume. Note: It's important to know the difference between the taxonomy of a food and its legal placement. This article uses the scientific divisions. I prefer science to the FDA's nonsense that corn is a vegetable. Corn is not botanically a vegetable, and it is not nutritionally a vegetable. It is only a vegetable to the FDA so that kids can be fed GMO corn in schools in place of a real vegetable. Any given individual eats roughly the same amount of calories every day. This amount can range anywhere from 1,000 to 10,000 calories. You probably eat between 1500 and 2500 calories per day, unless you're unusually small and inactive or unusually muscular and active. Because you eat the same amount of calories each day, you need to pack in all the nutrition your body needs within that amount of calories. Volume and calories have an interesting relationship. Foods high in fat will be high in calories for their volume. Foods low in fat but high in carbohydrates will be average in calories for their volume. Foods low in fat and low in carbohydrates will be surprisingly low calorie for their volume. Vegetables are low in fat and low in carbohydrate per any given volume. However, when measured per calorie, vegetables are incredibly high in antioxidants, protein, vitamins, minerals and fiber. This means that vegetables are the most efficient food per calorie. If you're hiking – and carrying volume is a problem – then nuts, seeds and dehydrated foods are great. They are high calorie for their volume, meaning your pack is lighter. However, if you try to survive on these foods, you'll develop chronic conditions such as osteoporosis, cancer, hypothyroidism, and so on. If you're worried about surviving through the winter and need to store as many calories as you can that won't rot, then seeds are great. This is why grains have been popular for millennia. Not because they are great for your health, but because they could be stored for survival during a long, cold winter. For every food you see in the grocery store, there are at least a dozen other varieties of that food out there. There are hundreds of kinds of tomato, hundreds of kinds of mango, dozens of kinds of banana, dozens of kinds of corn, and so on. Cauliflower and carrots both come in purple. Raspberries come in red, yellow and black. Currants come in red and black (although these are technically two different species). Bananas come in a variety of sizes, different shades of yellow, orange and red. Certain varieties of apples are pink on the inside. Potatoes come in purple, red, white and pink. Sweet potatoes can have purple skins with white insides, purple insides and purple skins, red outsides and white insides, and so on. The typical American market just has one kind of banana, two or three kinds of apples, one or two kinds of tomatoes, and so on. This little fact is so unknown that many people are under the impression that any new appearance, such as the "slimcado", is genetically modified. It isn't. They want to sneak GMOs under your nose and use crops that are bought the most — like corn, zucchini, cotton, canola, alfalfa and soy. They don't care about some little-known Florida avocado. Back on topic: If your supermarket's produce section actually offered all the items that could be grown in your area in every variety, the market would have to be ten times larger — and offer nothing but produce! Your biggest supermarkets carry only less than 1% of all the edible foods grown world-wide. With all of the ancient knowledge and new knowledge we have about agriculture, we now have the means to feed one hundred people per acre — without any electronics or gas-powered machinery. No chemical fertilizers needed. Currently the typical American farm feeds only one person per two to four acres. If we want to do something about fuel waste and hunger at the same time, we could work on more ethical and sane growing practices! You can learn about growing more food per acre in my article on the Myth of Overpopulation. Another facet of the infinite food conundrum is how much food we could be eating, but aren't. For example, there are mulberry trees all over western New York that produce pounds of berries each week for an entire month. Yet you see the berries as a purple mass on the ground, ignored. Perhaps you ignore these purple messes on your way driving to the grocery store. In California I often saw carob trees and olive trees with nobody harvesting them. On Kaua'i island there were literally five to sixty pounds of fruit being wasted per fruiting tree that I saw each day, especially with mangoes, breadfruit and mountain apples. Why aren't these foods collected and eaten? Part of it is cultural. We're used to getting food at the store, not at a tree. Part of it is the fault of the owners — they own the trees incidentally. As such, they don't care about the fruit the tree produces. It doesn't occur to them that other people might want that food. Part of it is lack of food knowledge — could you identify a carob pod or a mulberry? Okay, maybe you could, but what about the tree itself when it wasn't fruiting? We're not lacking in food, land or technology. We're lacking in education about plants. That's why websites like Eat the Weeds have sprung up — to fill the void, and why I wrote this article for you. If you'd like to learn more about how to improve your health and your life through key tidbits of knowledge, sign up for my e-course below.